Oriente Cuba was originally an entire province unto itself during Cuba’s long colonial period and into the twentieth century. After the success of the 1959 Cuban Revolution, the region was subdivided into the five present day provinces of Las Tunas, Holguín, Granma, Santiago de Cuba, and Guantánamo, yet older title “Oriente” remains in popular usage. The region is distinctive for its reflection of Caribbean cultural expressions, which prominently reflects African-inspired contributions, its close proximity to Haiti and Jamaica, and its mountainous terrain. Oriente also has had an historical African presence dating back as early as the 1520s and the area has been the province from which began all of Cuba’s military contestations for independence. The major goal of the image mapping project is to enhance public visibility of and familiarity with Africa-inspired religio-cultural traditions in Oriente Cuba. Oriente is generally an understudied region of Cuba and Africa-inspired religio-cultural practices in the area are frequently neglected in scholarship and popular representations of Cuba’s African heritage. Part of the website’s uniqueness lies in the first hand accounts and research in the area from Dr. Dodson and AART, reflecting some twenty years of experience. Our hope is that the website will serve as an educational resource for teachers, scholars, and members of the public, and will stimulate and enhance interest in Oriente Cuba and African-inspired cultural heritage issues. Cuboriente contains images of cities and towns of eastern Cuba that include Baracoa, Bayamo, Cabo Cruz, El Cobre, Guantánamo, Holguín, Manzanillo, Santiago de Cuba, and Las Tunas. 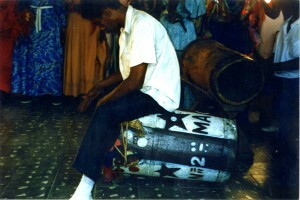 The project’s images, gathered from as early as 1994 to as late as 2010, exhibit contributions from Cuba’s African heritage in eastern Cuba. The Cuboriente website introduces users to Oriente Cuba and Africa-inspired religio-cultural content with an introductory “Orientation” statement and a colorful regional map on the homepage. The Oriente Cuba map allows users to click on a city or town and link to a location-specific slideshow of images. All images have captions and an introductory statement about the location, and can be displayed as either a page of photographs or a slideshow. While the site currently hosts over 50 images from nine locations, Cuboriente remains an ongoing project and we hope to substantively update the website with more content in the future.